Reclaim Equipment Company designs and manufactures state-of-the-art water recovery and treatment systems, reverse osmosis spot-free rinse systems, and Reclaim Ready high pressure pump plants for the car wash industry. While many reclaim manufacturers such as Con-Serv, Catec and PurClean simply sell water treatment systems, Reclaim Equipment Company goes a step beyond our competition by offering a line of high pressure pump systems specifically designed to use the water you've recovered. With our complete, Reclaim Ready equipment program, you could theoretically own your water forever! 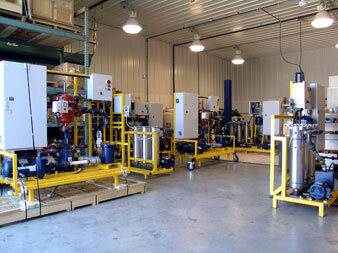 We call our complete water recovery solution "Reclaim Ready." If your site is not Reclaim Ready, what's the point of reclamation and treatment of your car wash waste water? What good is water recovery if your reclaim water simply tears your equipment apart? How much would reclaim really save you if your recovery efforts result in battered equipment? It's time to face it…recycled water is tough on equipment. Used in conjunction with our Reclaim Ready high pressure pump plants, our state-of-the-art Rainmaker Water Reclamation Systems allow you to realize a tremendous savings in water consumption without the associated headaches involved with odor, mess, equipment downtime and repairs. Reclaim Equipment Company is devoted to bringing you the very best hydro-recovery and re-use program available in the car wash industry today. We don't just sell you our products and leave you to figure it out...we want to build long-term relationships and improve the image of this industry. Our systems are backed by the knowledge and experience of generations in the car wash industry, as well as the rock solid components and services aimed at ensuring your success.